The 14 miles of ExpressLanes between Alameda Street in downtown Los Angeles and the 605 freeway debuted shortly after midnight. The initial toll to use the lanes from end-to-end was $3.25. 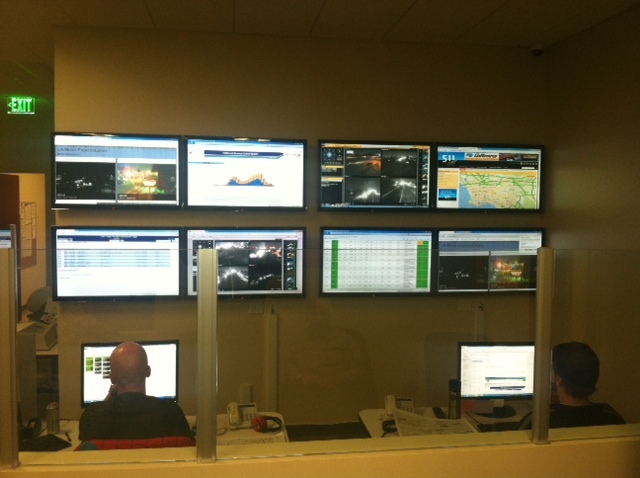 The above photo was taken in the ExpressLanes central office in Gardena last night after the lanes opened. Tried out the express lanes today, had my transponder and set to solo driver. I get pulled over by CHP, he tells me I got pulled over because it looked like I was driving alone. All I did was pointed to my transponder, he walks away, comes back and he let me go. Was a very funny experience. Why didn’t my comment get posted yesterday? There were no swear words or insults in it. Simply a critique of Metro’s “stealing” of our former carpool lanes that were once already paid for with tax dollars. Also, perhaps Metro doesn’t want the public to know that these “toll lanes” are practically empty on the weekends, while the common lanes are backed up.